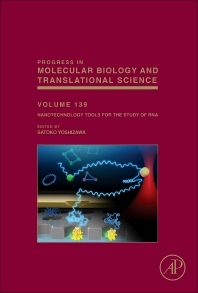 This volume of Progress in Molecular Biology and Translational Science introduces emerging strategies of studying RNA structure and function using nanotechnological tools. The volume aims to provide the readers with a novel view and give them opportunities to think about how to incorporate the new technologies into their own research. Researchers, professors and graduate students in biochemistry, biophysics, chemistry, molecular biology, biotechnology and medicine. Satoko Yoshizawa received her PhD in 1995 from the University of Tokyo, Japan. She was trained in chemistry and biotechnology and was a postdoctoral fellow at Stanford University with Pr. Joseph Puglisi. She is a Research Director at Institute for Integrative Biology of the Cell of CNRS in France. She is interested in structure and function of RNA in translation and takes multidisciplinary approach, molecular biology, biochemistry, structural biology, and nanotechnology. Dr. Yoshizawa was awarded for number of prestigious fellowships and prizes including Maurice Nicloux Prize from the French society of Biochemistry and Molecular Biology.